The Kensington Executive A5 non zipped folder boasts elegance and style. We suggest branding these with your logo and giving them out to your most valued customers. 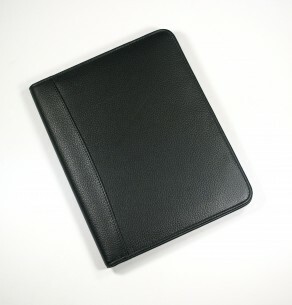 The folder features document, business/credit card, CD, USB and pen pockets (pen not inclusive). Available in brown and black leather. Made from Kensington leather, full hide grained nappa leather with a waxy and high end feel. The leather is tumble dyed with eco friendly agents to make it sustain the suppleness and good feel.